The anarchist JVP failing twice to capture power through despicable revolts staged against the elected governments of Sri Lanka, and prematurely entombing thousands of our youth, made another frantic effort through the last Presidential Election by bringing forth a power hungry egoist as a candidate, indisputably with a hidden agenda of achieving their fundamental objective of what they call 'establishing a Marxist Socialist Regime' in Sri Lanka, which they stupidly claim would be the panacea to all problems in Sri Lanka. The greedy UNP leadership swallowed their bait and the political desperados nourished by the International and Tamil Diaspora rogues who detest President Rajapaksa for eradicating terrorism from this country, joined forces with the common objective of defeating President Rajapaksa regardless of the dreadful egoist character of Sarath Fonseka, and the hidden plans he had to become the reincarnation of General Augustino Pinochet of Sri Lanka. The part-fallen JVP, knowing very well that they will be decimated at the forthcoming General Election made gigantic efforts to create turmoil and mayhem in the country, stating that the election was fraudulent and results were manipulated by a computer 'jilmart' and then over the arrest of Fonseka by the Army, under the Army Act, for violating rules and regulations of the Army. 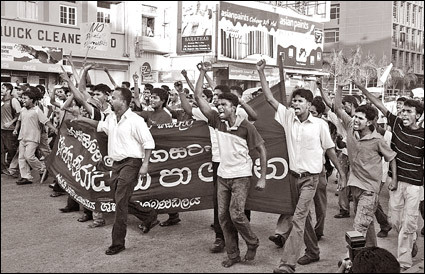 The incessant agitations being made by them despite the unprecedented lead obtained by people's President Mahinda Rajapaksa and the unfurling evidence of Fonseka's conspiracy attempt and violation of foreign exchange rules forewarn that the JVP's continual baseless agitations are aimed to steer the country into another anarchist period similar to 1971 and 1987-1989, and it needs to be stemmed timely and firmly by the patriotic and peace-loving population of this country. JVP leadership knew very well that may get maximum two seats including one seat from the National List, if they contest alone under their party symbol, the soundless bell. This is the last thing that they wish to see as such a result would dissipate even the few misled individuals following them and scattered in various parts of the country with the blind belief that they are the saviours of this country. To hide their political nakedness they made every effort to mislead the UNP facing the election in the name of UNF in an alliance with despicable communal gangs, and Liliput political desperados, to accommodate them in their nomination lists and even attempted to force the UNP not to contest in their party colour green and with the symbol elephant, hoping they could gain some additional Parliamentary seats by contesting in this manner, as they managed to fool Chandrika during the 2004 election and managed to obtain 39 seats and prevent equal number of SLFPers getting elected. Having failed in all their wicked attempts they have finally come out to contest the election with a ready-made alliance called Democratic National Alliance (DNA) with power hungry SF as the leader of this Alliance. By contesting under this ready-made Alliance they attempt to achieve two objectives. To continue with their anarchist agitations in the guise of demanding the release of Fonseka and thereby provoke the Government and the Security Forces in order to create mayhem in the country and make maximum effort to get the votes of persons who still show some sympathy to Fonseka and thereby get some of their members elected, and camouflage their real political strength. From the nomination lists they have submitted in various districts it is clearly evident that the JVP leadership has accepted the reality that they do not command votes any more and hence they depend on Fonseka in the Colombo District and similar individuals in other districts to get their votes increased. Many prominent pundits in the JVP are avoiding contest including Somawansa Amarasinghe, General Secretary Tilvin Silva and the former Parliamentary Group Leader Anura Kumara Dissanayake who think that he is omniscient. This guy has fled Kurunegala District unable to face his apparent defeat in Kurunegala and seeks refuge in the National List to grab the solitary National List seat they may gain on account of islandwide tiny percentage of votes they would get. Incapable of facing the electorate they are forcing Anoma Fonseka to mount their stages and shed tears so that at least a few kind hearted womenfolk would cast their votes in sympathy. This is the first time in the history of the JVP that they are scared of facing election. In the meantime, Anura Dissanayake is talking of an Interim Government they would be forming for a period of three years, along with other parties in the Opposition. Even the remotest possibility of the whole Opposition together coming anything near to forming a Government is sheer daydream as it is evident throughout the country that the Government is moving towards a massive victory as in the last Presidential Election, and speedily approaching the target of getting the two-thirds majority. Even the UNP Leader, and the General Secretary have conceded their defeat and only calling for the voters to avoid giving a two-thirds majority to the Government. The JVP atrocities since its inception and destruction caused to Government properties and murder of our politicians, the professionals, the students population and the innocent masses is almost equivalent to the destruction caused by LTTE terrorists. * Our universities becoming a den of political thugs who force innocent poor students to be used as cats-paws to achieve their political agendas to transform our universities as warring grounds shattering the hopes built by innocent parents through hard labour and their savings to see their children becoming educated and valuable partners in the country. * Creation of unrest in the Government Departments and State Corporations to paralyse State Services with unwarranted and baseless strikes and work stoppages for the sole purpose of bloating up JVP strength. * Attempts made to mislead, force and drive the student population to attain their political objectives and infringe their educational careers. * Planning of politically motivated turbulence in private sector industries, hamper production activities and even force the industries to the verge of closing down their activities with utter disregard for the consequences that may result from such actions to the workforce and to the national economy. * Obstruction of holding examinations and blackmail the authorities with utter disregard for sufferings that may befall on students and the anguish to be experienced by the parents. * Driving the staff of Government Hospitals to work to rule and other form of sudden work stoppages and make the poor patients to suffer and even cause untimely deaths, as most of the patients who get admitted to Government Hospitals are either unable to afford getting treatment at Private Institutions or suffering from chronic diseases, or subjected to severe accidents. * Making attempts to disrupt rail and road transport at their whims and fancy, and cause hardships to commuters. * The twin atrocities of JVP and LTTE drove this country back by several decades and it is the duty and responsibility of all peace loving population to wipe out the JVP menace and create an atmosphere for this country to rise once again and march towards self-reliance and ushering in a bright future for our posterity.